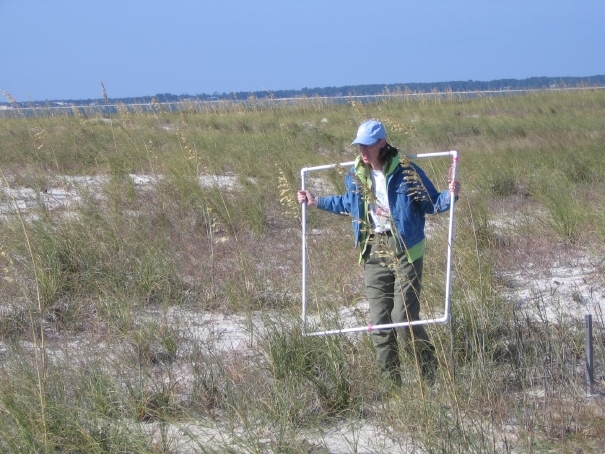 We are interested in both the short- and long-term patterns of vegetation on barrier islands in the Northern Gulf of Mexico. Barrier islands occur along many coastlines worldwide in areas prone to high disturbance from storms. The fronting dunes protect inland areas, including both human habitation and natural resources such as seagrass, oyster beds, and salt marshes, all of which serve as nurseries for important fisheries. Understanding barrier islands is very important for the ecology, conservation, and economy of coastal areas. In ecosystem ecology, barrier islands are interesting because of a dynamic tension between the shapes and positions of the dunes and the vegetation growing on them. The dune structure determines what plants will establish and grow, while the vegetation can control the stability and dynamics of the dunes. Meanwhile, both dunes and the vegetation undergo succession as islands build. Sand dune communities have also been used in many classic studies in ecology, going back to Cowles work in the 1890s on succession. The original project began on St. George Island in 1999, when we established 6 large 7 x 7 grids of points across foredune, interdune, and backdune areas at the eastern tip of the island. These plots have been censused annually and were expanded to 9 plots in 2010. Currently, the plots are also used by the graduate Quantitative Methods class each fall; the students help with the census and analyze each year's data to learn methods in ordination. The St. George study has produced a number of publications, with others on the way. In particular, we published one of the first papers on long-term vegetation dynamics and the effects of weather (Miller et al. 2010), as well as an early model of how increasing incidence of hurricanes may affect dune plant communities (Gornish and Miller 2010). Elise Gornish also used the long-term data to inform choosing species for dune restoration (Gornish and Miller 2013). In 2010 we also began similar annual sampling on Crooked Island near Panama City and Santa Rosa Island near Pensacola. These sites use similar methods as used on St. George and were initially established to look at possible effects of the Deepwater Horizon oilspill. -- Data from all three sites are available on request (miller@bio.fsu.edu). -- We are beginning to explore spatial patterns of individual species through time. Species differ in exposure and sensitivity to weather events, resulting in very specific spatial patterns through time. Extremes include species such as Uniola paniculata and Schizachyrium maritimum, which show relatively constant patterns across time and space, as contrasted with Heterotheca subaxillaris and Oenothera humifusa, which are very salt-intolerant and thus greatly affected by storms.